A Girl Called Erika: Cupcakes! 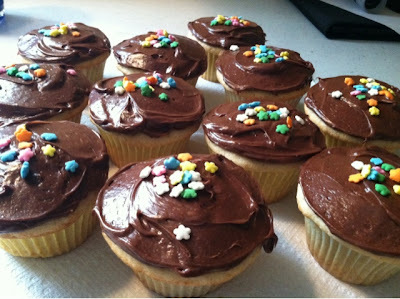 Yesterday, I made some vanilla cupcakes. Not from a mix. I feel very accomplished. I used Joy the Baker's recipe (this can be found in her cookbook) and I was very happy with the results. Boyfriend was happy as well. After they cooled down, I frosted them with chocolate frosting (didn't make that from scratch... some day, perhaps) and put a few fun sprinkles on top. I think what I liked best about them was that the flavor of the cupcake itself was really subtle. They were just simple and lovely.